TA/TM Day returns this Friday 6th January on Burnaby campus, featuring a wide range of free workshops. Whether you are just starting your first teaching appointment, or if you have many semesters of experience, there will be classes on offer that will help you successfully navigate your experience as an education worker at SFU, and will provide you with many useful ideas on improving your teaching practice. Workshops cover topics such as developing your students’ research skills, maintaining your well-being, making your classroom a more inclusive and safer space, how health & safety law affects you, medical benefits available to you, and how to deal with difficult situations in the job. There are also workshops dedicated to specific types of teaching roles, such as Tutor Markers, lab-based TAs, and writing intensive course tutors. Further information, including a full schedule of events and workshops for the day, can be found here at the Teaching and Learning Centre. For TAs and TMs, note that each teaching appointment you have entitles you to 6 hours of professional development, so any time spent at TA/TM Day can be logged in this way. If you weren’t able to attend back in Fall, or couldn’t go to all the workshops you wanted to, come this Friday! Be sure to keep close track of your hours worked throughout the semester! Either come to the TSSU office in AQ 5129 for a free logbook to help you, or use our online version available here. 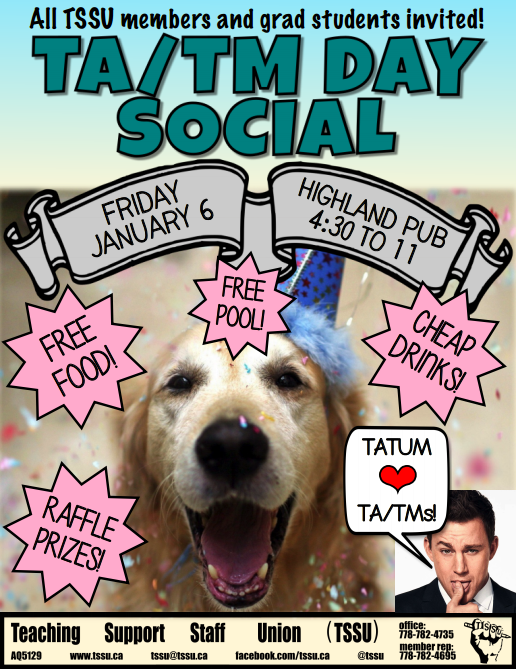 Following TA/TM Day, TSSU will be organizing a free social event at Highland Pub, starting at 4.30pm. Cheap drinks, free pool, and free burgers (including meat, vegan, and gluten-free options) will be available. There will also be multiple prizes for those lucky in raffles or skilled at coloring (pencils and paper will be provided).